This page defines the Triangle Sum Theorem. NEW This page illustrates the sum of interior angles for triangles, and several other shapes. NEW This interactive applet shows how the sum of the interior angles for any triangle always add to 180 degrees. NEW This page contains explanations and practice problems on several triangle inequality theorems. NEW This page contains an example and practice of indirectly proving a statement by contradiction. This page contains an explanation of the triangle inequality theorem with a movable triangle to demonstrate. This site has a game to practice determining if a triangle could exist based on the length of its sides. This page defines congruent triangles and the qualifications for them and lists the methods for proving congruency. 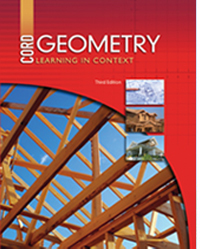 NEW This page contains several links to definitions, examples, and practice for identifying congruent triangles. This site contains a video tutorial with notes on proving triangles congruent. This page details the different methods on how to prove triangles congruent. This site contains an online quiz about using congruent triangles. This page discusses the isosceles right triangle theorem and has interactive questions. This page contains definitions of altitudes, medians, and perpendicular bisectors. This site explains altitudes, medians, and bisectors and has pictures of each.